Can a drop-down have multiple options like selecting between views, Freezing the 1st column & customizing the columns? I'm kind of confused whether the drop-down can have this feature. If yes, please provide reference examples. Usually, dropdown is used to select one or multiple values for a given form field. Alternatively, it's also used to wrap common navigation links into a component. The design which you intend to use is not exactly a dropdown. It's a flyout sidebar or a modified version of a modal. So, make that look like a modal or sidebar. A designer or a developer will tell you that you can, and most design or development frameworks are much more modular in nature these days so we do see some 'creative' implementations such as the ones you see in the answers. But I think the more appropriate questions is whether you should or not. 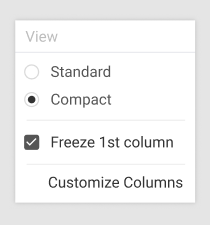 The idea of a dropdown is to provide the convenience of holding a series of values without taking up the space normally required to display them all. Of course, when you don't have many items or the number of items is not expected to change then it is much more efficient to display them all (e.g. selecting Male/Female on a form). So the concept of a dropdown is just to allow a user to quickly select a value among the range of possible options, but if you add more complex options then the possibility of user input error (not to mention logic and programming errors) increase. This defeats the purpose of keeping forms simple and easy to understand, so what seems like a good design/development decision does require some validation with the user to justify straying from conventional wisdom. Often in mobile applications we might see more complex user interface elements because the trade-off is required given the lack of space and the constraint of touch interactions. Once again it needs to be weighed up against whether the feature is frequently accessed and if errors can be avoided easily. Not the answer you're looking for? Browse other questions tagged usability tables dropdown drop-down-list or ask your own question.